It is agreed by everyone (except the nuclear industry) that nuclear power is the most expensive form of electricity – more expensive than wind energy, solar photovoltaic (PV) and more expensive that concentrated solar power (CSP) with six hours of energy storage. The South African government has researched this during the Integrated Resource Plan (IRP) process, and come to the same conclusion. This graph, extracted from the final IRP report, clearly shows that if the 40% cost overruns (which are inevitable in nuclear power) are included, then all the other forms of power generation are cheaper to build. 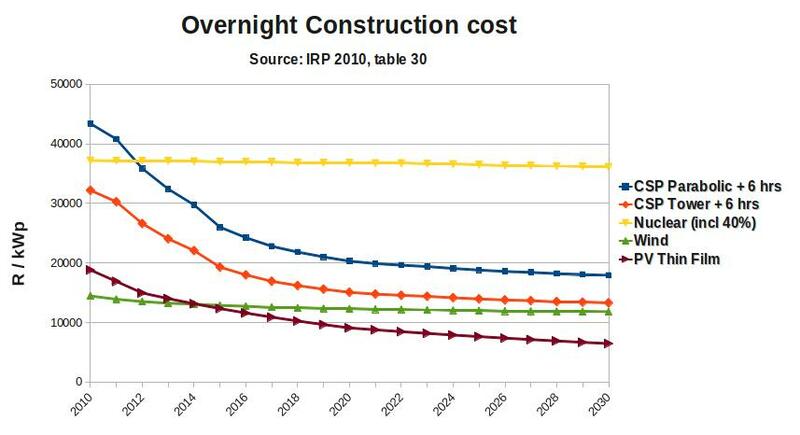 Note, however, that these are the construction costs per kW peak only. Calculating the cost per kWh is complex, and requires many assumptions around capital costs and repayment terms, load factor, plant life time and in the case of nuclear, decommissioning costs, long term waste management, fuel costs and insurance premiums. The reason for the costs of renewable energy falling over time, is that as the technology and volume of sales improves for renewable technologies, the cost will fall. Every year, nuclear power looks like a more and more stupid option. This is why the nuclear industry is pushing so hard for an order to be signed now. Thanks to Peter Becker for the informative talk in Hermanus on Monday 21st Nov. If that 45 minute talk with visuals could be put on 100’s or 1000’s of DVD’s and distributed to key people to watch and pass around – ending with a message giving a definite plan/s of action in answer to everyone’s question “What can I DO that will actually make a difference” – we need to do something NOW, before that Trillion is committed. I really believe we/you should NOT be sold as a “radical group of activists” but a rapidly growing group of alarmed citizens who are well informed and are not going to allow this to go ahead! It is also not about “saving Bantamsklip” – not many people are going to be motivated by that – the reality is that it is about saving the Western Cape and avoiding another “arms deal” (bigger and more dangerous though) from happening. I am finishing off a job this week and will make it my business to contribute to the above plan IF it hasn’t already been done. Please respond to my suggestion or tell me what I can do to support your own plan.